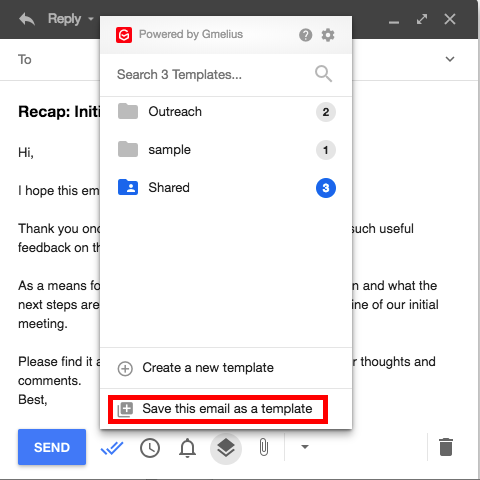 To create a new email template from your dashboard, go to the Template section of your menu and click on the red plus button located in the bottom right corner. To create a new template from an email, click on the layer icon of your compose window and selecting " Create a new template" or if you have written an email which you wish to save as a template select "Save this email as a template". Template name: Choose an easy-to-remember name for the template. Hashtag: Use a hashtag in your compose window's subject line to automatically insert the template. Subject: Set a subject line in this field. Body: Add formatted text in this field. Note that you can add a number of variables, such as the name and email of your recipients, that will be automatically inserted. Send from: Set which addresses to send the template from if you manage more than one email address from your mailbox. Label as: Automatically add specific labels to the email. Add Bcc/Cc recipients: Include other recipients automatically. Category settings: Organize your templates into different categories(folders on the left side panel) to match your workflow. To edit a template, click on its name to select it, make the necessary changes, and click the Save button to confirm your edits. Business users also have the option to share templates with members of their team.